1 Preheat oven to 350 degrees F (180 degrees C) and place the oven rack in the middle of the oven. 2 In a large bowl combine the flours, sugars, baking powd, baking soda, cinnamon pwd, salt and chocolate chips. Use a whisk to combine. Set aside. 3 In another bowl combine the mashed bananas, yogurt, butter and vanilla. With a wooden spoon, lightly fold the wet ingredients (banana mixture) into the dry ingredients until just combined and batter is thick. Do not over mix the batter. 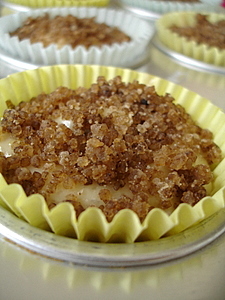 4 Prepare crumb by combining together the brown sugar, flour and butter. Keep aside. 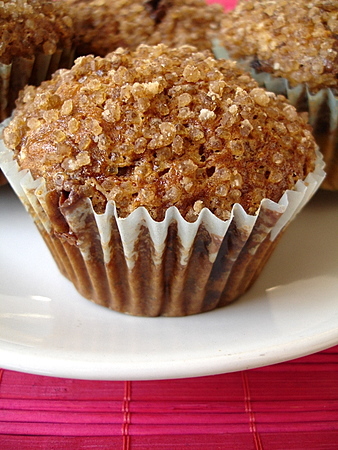 5 Spoon the batter into the prepared muffin liners half way through and sprinkle some crumble on top of each muffin. 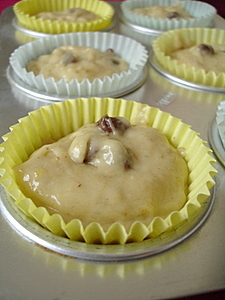 Bake for about 22-25 minutes or until a toothpick inserted in the center comes out clean. 6 Place on a wire rack to cool and remove muffins from pan. Serve warm or at room temperature.